Document 61 - Minutes of the meeting of the Workers' Party of South Africa, Johannesburg Branch, held at 90 President Street, Johannesburg, 25 March (1936) at 8.30 p.m. 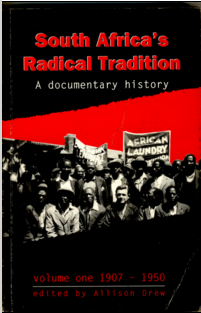 Document 62 - Minutes of the meeting of the Workers' Party of South Africa. Johannesburg Branch, held at 90 President Street, Johannesburg, 3 April 1936 at 8.20 p.m. Document 65 - Minutes of the meeting of the Workers' Party of South Africa. Johannesburg Branch held at 90 President Street, Johannesburg, Friday, 24 July 1936 at 8 p.m. Document 118 - Johannesburg District Communist Party, Call to a Non-European United Front!